Our event on June 5 was a half day of expertise sharing and discussion about where the oil and gas industry is going in the current oil price environment - and new ideas for improving your business and personal viability. Can we get Costs (way) down? Is it time for CRITE (Cost Reduction In This Era)? Are there new, better cost/barrel, development technologies? 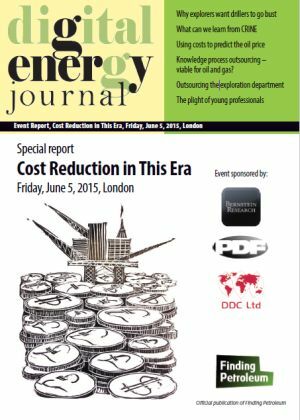 Can Standardisation deliver 10’s of % cost reduction? and is it time for a more outsourced work force? Is this the way to re-charge Mature Provinces, for example the UKCS; NOCS; much of South East Asia? 10:40 Coffee & Tea; Exhibits followed by SESSION 2: Where are the opportunities? Simon guides clients and colleagues towards successful Knowledge Process Outsourcing services provided by The DDC Group. DDC is a BPO specialist helping businesses across numerous disciplines improve access to the data they rely on through large-scale, bespoke document and data conversions. Simon’s former employers include Lason and Saztec (R.I.P.). He has 25 years' experience working with the wonderful people of the Philippines. Mark is Managing Director of P.D.F. Limited, a successful exploration consultancy with a >20 year track record in helping E&P companies succeed in exploration, operations, new ventures and corporate development. PDF are currently highly active in Africa and Central/Eastern Europe. Mark is an experienced explorationist and has a PhD in structural geology from Imperial College, London, UK. He started in the oil industry with Maxus Energy, firstly in London and then in Dallas, Texas where he worked on global New Ventures, exploration & operations and development projects. Mark founded PDF as an exploration consultancy in 1994 and since then has worked extensively on projects in Africa, Central & Eastern Europe, the North Sea, Indian sub-continent, Madagascar, South American fold thrust belts and the near East, as well as ‘unconventional’ projects in several continents. Mark is also proud to be a PESGB Young Professionals mentor.